An actor and a model, Lee Dong Wook, 36, is one of the male fashion icons in South Korea today. He recently wore apparel from an Italian luxury fashion house for the Taiwanese version of a worldwide lifestyle magazine. 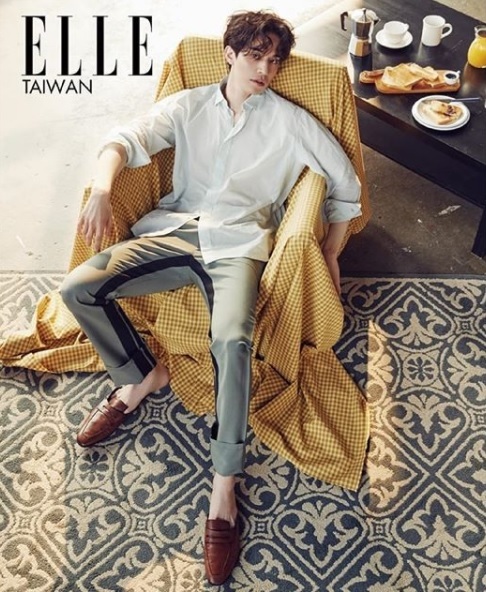 Lee graced the March 2018 issue of Elle Taiwan. In one of the photos of Lee in the magazine, he lazily slumps on the sofa with messy hair as innocently looks at the camera. In the photo, Lee is wearing a pink green shirt and a pair of caramel color slipper shoes, which are both from Berluti. It was paired with a pair of contrasting striped trousers from Prada. The pair of Prada trousers is available on Farfetch worth $1,052. Made in Italy, the trousers’ lining composition is 100 percent cotton while its outer composition is 60 percent mohair and 40 percent wool. Carefully constructed from cotton and a mohair-wool blend, the Prada trousers have a contrasting black stripe, a turned up hem and a concealed front fastening. The trousers feature a waistband with belt loops, side slit pockets and two rear flap pockets. Also seen in Lee’s photo wearing Prada are some toasted loaf bread on a small table. In his interview with the magazine, he revealed that he sometimes cooks his own food as long as there are recipes of either Western of Korean dishes. Apparently, an actor-model wearing Prada was not what Lee wanted when he was young. He told the magazine that he first wanted to become a Korean language teacher then he thought about being a firefighter because he thought it was a very handsome thing. While Lee did not become a firefighter, he ended up doing a very handsome thing, acting and modelling. He is set to star the series “Life,” which will premiere on JTBC in July 2018.